The number of E. coli cases tied to Northwest Chipotle restaurants climbed to 37 on Tuesday, with 25 sickened in Washington and 12 in Oregon, health officials reported. Cases in a Northwest E. coli outbreak linked to Chipotle restaurants climbed Tuesday to at least 37 sickened in Washington and Oregon, health officials reported. The new tally includes 25 people in Washington and 12 people in Oregon who’ve fallen ill with Shiga toxin-producing E. coli. At least a dozen people have been hospitalized in the outbreak that shuttered 43 Chipotle restaurants in the two states. No deaths have been reported. Washington cases include 11 in Clark County, six in King County, four in Skagit County and two each in Cowlitz and Island counties. Ill people ate at five Chipotle sites, officials said. The window of concern now dates back to Oct. 1, Dr. Kathy Lofy, Washington state health officer, said at a Tuesday news conference. “Everybody who ate at a Chipotle prior to their closure last week could be at risk,” she said. Diners who developed diarrhea, bloody diarrhea or vomiting during that time period should contact their health providers. Case numbers are expected to rise as more victims are identified. Officials still haven’t identified a common food that links the outbreak cases. 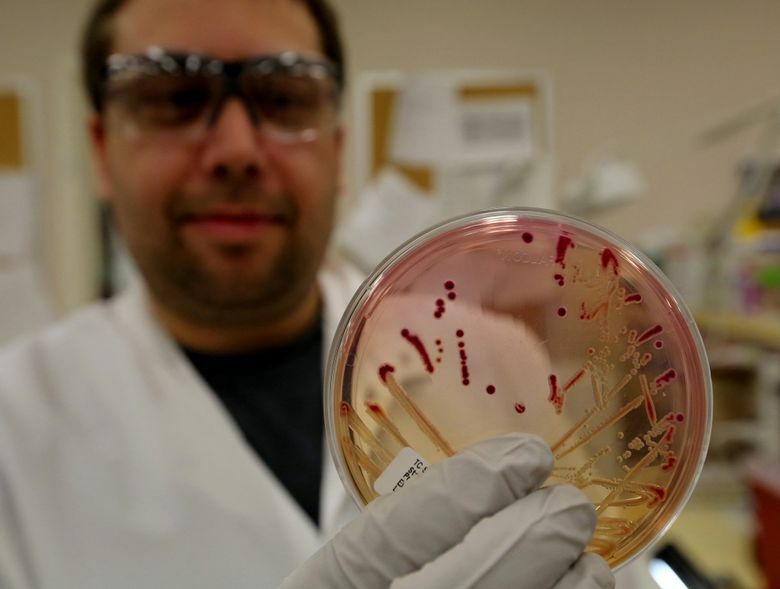 Testing could take several more days as investigators determine the particular strain or strains of E. coli — and the genetic fingerprint of the dangerous bugs. But health officials say confirmed cases so far have been caused by E. coli O26, which produces the toxins that can cause serious illness in humans. In Washington, 10 of the 25 confirmed cases are tied to the E. coli O26 strain, Lofy said Tuesday. A recent E. coli O26 outbreak was linked to raw clover sprouts in Jimmy John’s sandwiches, but the bacteria also have been implicated in outbreaks tied to ground beef and strawberries or blueberries. In this outbreak, fresh produce is the most likely culprit, said Dr. Jeff Duchin, health officer for Public Health — Seattle & King County. But, he added, he can’t say that health officials will identify a specific cause with certainty. Such investigations are difficult because they involve complicated foods with multiple ingredients, he added. This is the second outbreak involving Chipotle in King County in the past three months. In July, five people were sickened with E. coli O157: H7 after eating at the chain, including two victims who were hospitalized, health officials said Tuesday. No source was determined in that outbreak, which was not publicly reported at the time. It is unlikely to be related to the current outbreak, Duchin said. Officials with the federal Food and Drug Administration (FDA) have been testing food samples from Chipotle restaurants at the agency’s Bothell laboratory. In addition, investigators have been interviewing people who fell ill — and those who didn’t get sick. With cooperation from Chipotle officials, investigators are reaching out to people who ordered food online to serve as a control group to help determine the cause of the outbreak, said Dr. Katrina Hedberg, Oregon’s state health officer and epidemiologist. Because investigators will have access to exact records of what the diners ordered, plus detailed contact information, they can determine whether there’s a difference between what people who fell ill ate versus those who didn’t get sick. Officials with the Centers for Disease Control and Prevention said they are monitoring the Northwest Chipotle outbreak, but allowing the state agencies to lead the investigation.